Scalp: A quick intraday trade. Scanner: A tool used by traders to compile a list of stocks to potentially trade based off of predetermined criteria (filters). Shakeout: A scenario in which investors are scared out of a stock before the stock makes the intended move. Short Interest: The number of shares that are sold short that investors have not yet covered. This is usually expressed as a percentage of the float. Short Squeeze: A scenario in which the price of a stock that has a high short interest makes a bullish move quickly, resulting in panic covering from short sellers. This results in a significant contribution to the momentum of the stock. Simple Moving Average: A type of moving average that is calculated by averaging the closing prices of a certain number of data points. This is the most commonly used moving average as it provides equal weight to each data point. Spike: A sudden increase in share price on high volume. The stock usually drops after this sudden move to the upside. Spread: The difference between the bid and the ask. A larger spread usually indicates that the stock is more volatile and risky. Stairstepper: Price action in which the stock slowly upticks/downticks, taking typically more than a minute to make multiple upticks/downticks. Stop Loss Order: An order type that allows investors to buy or sell a stock when it trades passed a certain price. This is a great order type to use in order to define your risk and stick to your game plan. Support: A price level in which a stock has difficulty breaking below. Many investors like to enter long positions or exit short positions at support. 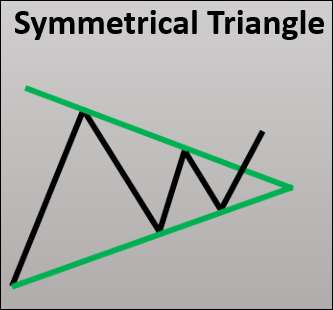 Symmetrical Triangle: A chart pattern in which two converging trend lines (one upper and one lower) provide an opportunity for the stock to make a decision to resume its trend or reverse it. A breakout through either of the two trend lines signals the upcoming trend.